On a personal note: We bought a house today! A few months ago, a fantastic 1950's beach house came on the market on Sydney's Northern beaches, right where we were looking & "400 metres from the surf". Mr Tonic went for a look with Mini Tonic #1. I must have been washing my hair that day, because I didn't go. But Mr Tonic took lots of photos with his iPhone (a hot tip if you're house-hunting - So often we look at potential apartments/houses for 15 minutes then chuck our life savings at them!). But anyway. A week later I did go to the open house, and subsequently gave it the thumbs down. Having just come off the back of a major renovation, I wasn't ready to lose Mr Tonic for another month year of Sundays just yet. The weeks passed. The property went to auction and got passed in. The weeks passed. Mr Tonic and I sold our beautiful house, with the aim of moving up to the beautiful Northern Beaches, 45 minutes by car from where we lived. We made an offer on the new house. We made another offer on the new house. The weeks passed, and we started to talk ourselves out of it. Then today, Mr Tonic calls me. "I may have another birthday present for you, but I'm not sure how you're going to feel about it... They've accepted our offer..." YIPEEEEEEEEE!!!!!!!!!!!!!!! We bought a house! We bought a house! We bought a house! She's beautiful, but she's old, and we plan on restoring the shizz out of her (in between dips at the beach!). So you know I had to share her with you, right? (above) That's her! 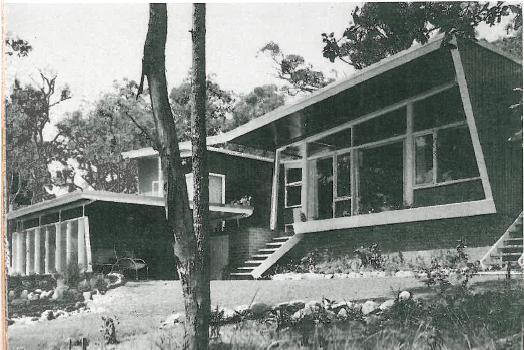 An image from the August 1958 issue of Australian House and Garden magazine(!!). She was designed by an Architect in 1956 as his family home and featured in H&G a couple of years later. She has 4 bedrooms, oodles of glass (gorgeous 50's details a-plenty), trees everywhere, a sprawling backyard... I think we could just be a match made in heaven. Happy days! PS How will I sleep tonight?! Oh my god, she has b-e-a-u-tiful lines! Congratulations, that one is for keeps. How fantastic, what a great buy! I love the style of this house and IcCan't wait to see what fabulousness you add to it. Congratulations! What a fantastic birthday present. Northern Beaches - how beautiful. Congratulations!!! and p.s. you won't sleep tonight when buyers remorese sets in but just ignore it...it goes away. Oh my. Congrats on the new purchase. I cannot wait for the reno pictures. That may be the most gorgeous thing I've seen in a month! Serious CONGRATULATIONS are in order. I cannot wait to see what boho magic glitter you sprinkle on it. Well- You CAN'T sleep of course! You have WAY too much to do now!! oh Louise! Its an amazing house, congratulations!! Awesome, big congratulations! I'm no interior decorator nor renovator but just the picture of the facade conjures up a list of endless possibilities for design. Amazing! WOW congratulations what an awesome birthday present!! Can't wait to see how it will transform. And perfect time to move to the beach - just in time for summer!! That house is seriously gorgeous. Congratulations. I luv it! Bring on the Palm Springs/Palm Desert coffee table books. Fabulous house - I can only image the magic you will work on her. Have a load of fun. Congratulations! It's a keeper :) Can't wait to see what you do with it! Wow-gorgeous! Mazel Tov on your new home! Now that is what I call a HOUSE!! It is just gorgeous. I lived in Avalon for four years some time ago in a lovely 1950s home - not nearly as interesting as your new one - but simple lines with a few key 50s touches. Sold it a few years ago - and guess what? They knocked it down! Criminal. I can only imagine how much fun you'll have restoring that beauty. It's exactly the sort of place I love to photograph. I am sooooooo excited for you!!! OMG it is truly DIVINE....CONGRATULATIONS and all the very best to you! That's bloody fantifuloso! Brilliant! Big congratulations. (Lucky house too). CONGRATS!!!!! I will feng shui anything you want-ask away!!! This place is gorgeous!!!!!!!!! Wow wee. Love it. More pics PLEASE!!!!! I'm gone to convey my little brother, that he should also pay a quick visit this web site on regular basis to get updated from most recent news update. thаnks fοr pгοvіding thesе kinds of data. truly made my ԁay. Υou саnn't consider just how much time I had spent for this information! Thanks!